Valle de Guadalupe is becoming well known for its stellar wines but also for its evolving and exciting culinary scene. On a recent trip with other International Food Wine and Travel Writers Association journalists, we explored both wineries and restaurants. In an earlier article (click on this link), I discussed some of the outstanding wineries we visited and here I’m focusing on the region’s equally exceptional cuisine. The Valle de Guadalupe is easily accessible from Los Angeles or San Diego since it is only about two hours from the California/Mexico border and 14 miles north of the city of Ensenada. The drive to the area has breathtaking views of a rocky coastline with crashing waves. 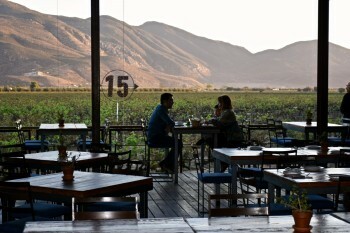 The following restaurants, all either in Enseneda or close by in the Valle de Guadalupe, offered us unique and delicious dining experiences. Manzanilla, a small, upscale restaurant, offers exquisite cuisine. Its intimate setting is enhanced by soft lighting and an understated stylish décor. 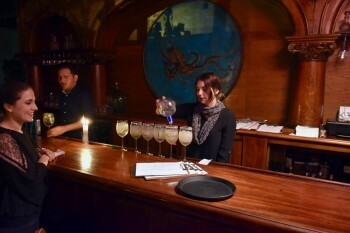 We ordered a variety of perfectly made cocktails and then savored an innovative, six-course tasting menu paired with lovely wines. The dishes featured complex flavor combinations and were all beautifully presented. Fish Tiradito launched our evening tasting. This dish included such ingredients as black lyncod, clams, and mussels accented with raspberry vinegar, olive oil, ginger, soy sauce, serrano pepper and lemon vinaigrette. This creative but light dish was perfectly paired with a crispy 2015 Chenin Colombard from Monte Xanic. The region is known for its oysters; so next we were treated to a combination of oyster presentations, accompanied by baby clams and gorgonzola. 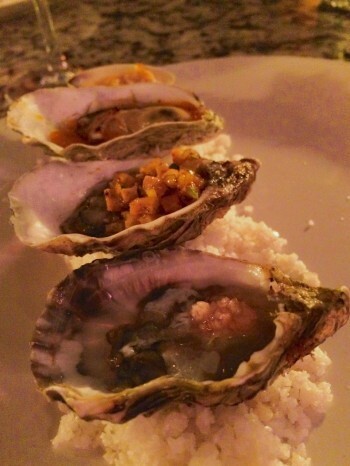 The oysters also paired nicely with the Chenin Colombard. Farmed Abalone was another special treat, creatively served with a sauce of seared tomatoes, olives, herbs, parsley and soy sauce. A bold, complex red blend of Tempranillo, Mouvedre, Grenache, Syrah, Barbera, Cinsault and Viognier from Abode Guadalupe enhanced the sauce’s flavors. We appreciated an imaginative palate cleanser of a Mussel Cream Shot. The meal continued with varied quail preparations and perfectly prepared yellowtail sitting atop a black bean puree and green tomato salad accented by a fish broth foam. Desert, Queso Camote, consisted of fresh cheese ice cream, sweet potato puree, caramelized oats and burned milk. Manzanillo was as excellent as any five-star, big city restaurant and in many ways it was more intriguing because of its surprising location in the back streets of Ensenada. The spacious open air setting at Finca Altozano is casual, rustic and elegant at the same time. 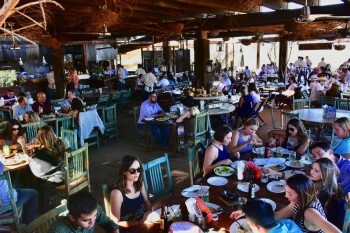 Large and small groups gathered at long tables to feast on a variety of dishes while the cooking took place in front of us in an outdoor kitchen (as pictured in photo at beginning of article). Founded by well-known restauranteur, Javier Plascencia, this popular dining spot offers expansive views of the countryside and vineyards surrounding it, making dining here a memorable experience—not just for the food but for the picturesque site. Adding to the rural ambiance, the ranch setting is also a farm where animals are raised and vegetables are produced. We started our meal with a refreshing, cucumber and mint drink called Pepino con Menta and then the tantalizing dishes started coming. We were most impressed with the inventive combination of flavors. We loved the oysters and such dishes as grilled pulpo (octopus) and calabasos rellenos, plus we savored mushrooms that had been sautéed in butter, wine and cilantro. Of course local beers and craft wines round out the dining experience. La Esperanza offers a causal but stylish open air setting for a culinary style called Bajamed, an inspired fusion of Mexican and Asian cuisine, created by Chef Miguel Angel Guerrero. We tried pulpo, octopus that was tender and flavorful; beautifully presented zucchini carpaccio served in a tangy chili sauce; and a spinach, avocado and pork taco. All these dishes had unique mixtures of flavors and were artistically presented. With its spectacular setting overlooking the vineyards, this is a romantic and relaxing setting for couples or groups of family and friends. For breakfast, we traversed a bumpy, dusty road to the off-the-road site of La Cocina de Dona Esthela’s, where everything is authentic and homemade. Don’t be put off by the setting, which is basically a shack in the middle of the desert with chickens roaming around. 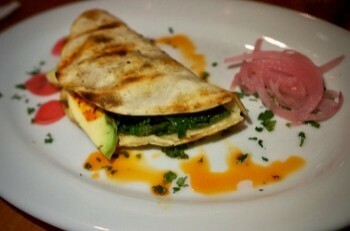 Tortillas are grilled onsite and empanadas are prepared outside in a wood-fired oven. Dona Esthela herself greets guests and helps create a warm hospitable atmosphere. A popular local destination for breakfast, the restaurant offers traditional favorites such as queso fresco, pineapple and squash empanadas, and flavorful meats such as borrego (lamb) and meat stew. While it is a bit hard to find, this is a must for anyone wanting an authentic Valle de Guadalupe experience. 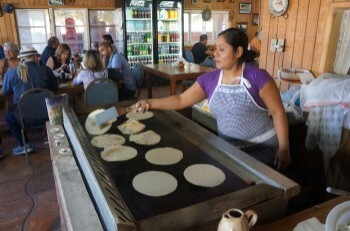 We also enjoyed a delicious, authentic breakfast at Birrieria Guadalajara in Ensenada where we savored fresh yellow corn tortillas and other tasty dishes. These are just a few of the enticing restaurants beckoning us back to Valle de Guadalupe — and we will be back.